In 2014, I published a post called Do Startup Require Less Capital to Succeed than 10 Years Ago? It’s been five years and time to see how things have changed. In the analysis, I created a metric, the return on invested capital (ROIC). ROIC is the number of revenue dollars that one venture dollar bought. In other words, at IPO, how much revenue per VC dollar did the company generate. In 2014 we saw increasing efficiencies over time, which was very exciting because it reaffirmed the efficiency of SaaS go-to-market. The chart above updates that analysis. As a reminder, the bars represent the ROIC for 4 year buckets starting in the year marked on the x-axis. Startups going public from 2006-2009 showed a median ROIC of 0.42. One venture dollar bought forty-two cents at IPO. In 2010, one venture dollar bought $1.24 of revenue at IPO. 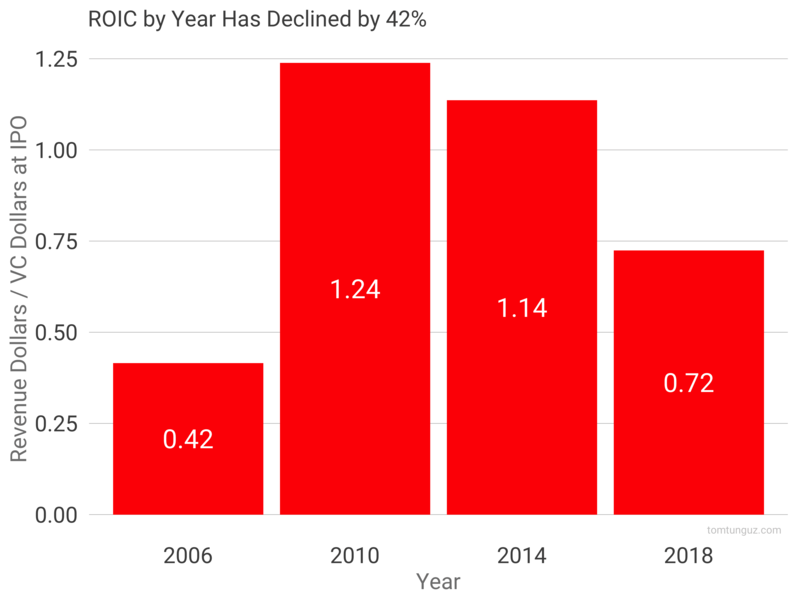 If we look at the ROIC across IPOs across the last 12 years or so, we see that same initial dynamic of incredibly efficient companies in the 2010 and 2014 IPO cohorts. But the efficiency is declining, markedly. There are a few reasons for this. First, availability of capital. The era after 2006 and through the 2008 financial crisis was a different time to raise capital. It was harder. You needed to do more with less. 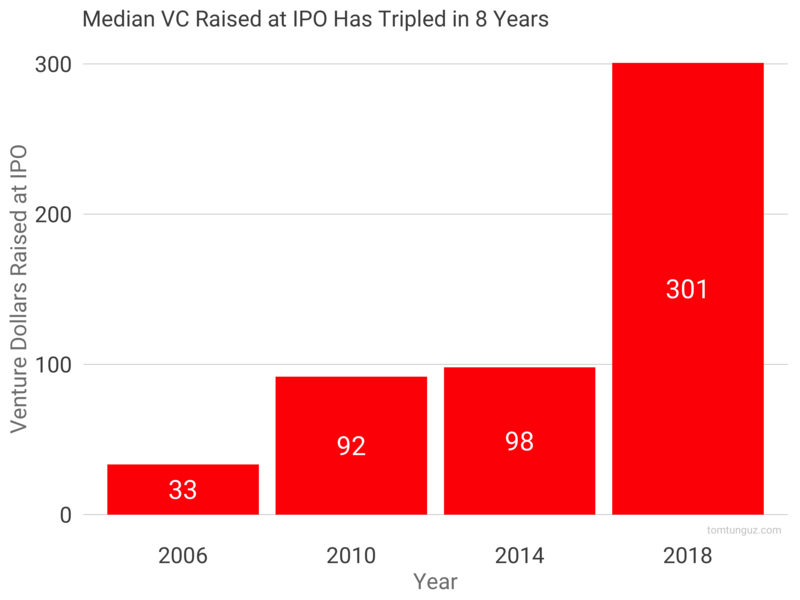 As the amount of private capital has increased, so has the median amount raised before IPO. It’s tripled from about $92m to more than $300M since 2010. With more capital, startups can take more risk, explore more customer acquisition channels (some which may not work), develop more products and potentially grow faster. And the financial market has met the need many times over, with bigger checks at larger valuations. Because of the surfeit of capital, SaaS startups face increasing competition and monotonically increasing costs of customer acquisition, increasing their capital consumption; to say nothing of increasing wages in San Francisco and across the US. And that’s borne out in the data. SaaS companies go public later. 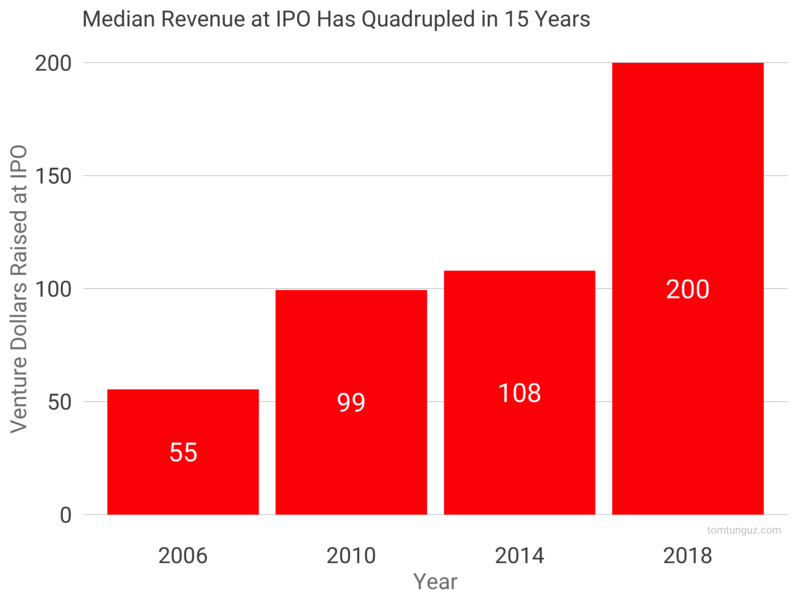 The median revenue at IPO has increased from $55m in 2006 to $200m in 2018-2019. That’s quite a jump! At least 2 more years of operation, likely 3-4 more years, which implies something like $75m-$150m more in opex. ROIC has declined a certain extent. It’s partly due to more competitive market dynamics, partly due to an ability to raise larger amounts of capital, and partly due to the desire to go public at greater revenue scale. None of these trends is a negative implication necessarily. The figures highlight the changing market dynamics created by an 11 year bull market in software and the ability of startups to experiment more, hire more to grow as quickly as possible; which is the most attractive thing to investors in today’s market.